Jun. 21, 2013 7:00 p.m. 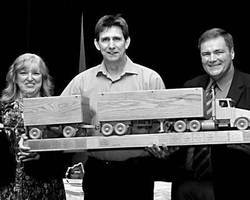 The 2013 Alberta Truck Roadeo Grand Champion Rod Harrison of Canadian Freightways accepts his trophy from AMTA pres Willie Hamel, with his wife proudly smiling. Griesbach Military Base, Edmonton AB – Trucking is an essential industry, in a world where the delivery of goods and equipment is critical to industrial growth and sustainability. It is an industry where safety is critical, a good career choice that rewards well for those who are ready to invest their energy and enthusiasm into all aspects of this demanding work. On Saturday June 15th at 6am, professional truck drivers from across Alberta gathered at the Griesbach Military Base Parade Grounds in North Edmonton to challenge last year’s champion of the Alberta Professional Drivers Championships. The Alberta Truck Roadeo is an annual event organized by the AMTA (Alberta Motor Transport Association), where the Grand Champion will attend the National Drivers Championships to take place later this summer in Abbottsford BC. Fifty drivers from various companies faced ten different tests, including Serpentine, Alley Loading Dock, Pre-trip Inspection, a controlled stop and a written knowledge exam. Several volunteers, including AMTA officials, had worked diligently to design and prepare the track and the event, and despite gusty winds and a threat of rain, the day began with laughter and excitement, as the drivers registered in this event did so of their own accord, to challenge their skills against the best in their industry. With a plentiful and delicious breakfast cooked by CEDA team members (Canadian Engineering Development Association), drivers, volunteer judges and AMTA officials joined to complete the registration, and the day’s event was ready to begin. The large Parade Ground was populated by the ten test stations, each supervised by three or four judges. Grant Dublanko, a Continental Cartage exec, was selected to be the Truck Roadeo Master to oversee the competition and the track layout, and also to resolve any dispute that might arise. Chris Plante and Don Chapman, trucking industry veterans, were the Track Master and Assistant respectively. From the beginning of the event, a dynamic announcer loaned his knowledge of the industry to aptly describe the proceedings and the drivers: sitting in the Calgary Stampede Stage trailer loaned for the day, Lane Kranenberg added to the excellence of the event with his rich voice and tireless energy. The Pre-trip Inspection was a critical test: eight ‘defects’ were planted on each of the four semis, the drivers expecting to perform their usual circle check of the truck and to find a minimum of five defects. They were very thorough, and it was fascinating to see them search for –and find- loose lug nuts and mud flaps, missing fuel caps, shovels improperly placed on the trailer floor. Some of the judges of this test were Edmonton and Calgary police officers and Commercial Safety inspectors. Another event took place concurrently. Under the umbrella of Alberta’s Solicitor General, the Alberta Inspectors Championships assessed the knowledge and inspection skills of safety inspectors. The International Commercial Vehicle Safety Alliance, CVSA (.ca) is comprised of all the Canadian provinces and territories, the US, Mexico and Puerto Rico. With Alberta’s thriving economy, transport trucks are a common sight on our roadways: industry insiders and followers know that is takes talent, diligent focus and proud determination for these drivers to become excellent at their job, and the industry rewards them well. The Deputy Minister of Alberta Transportation Sean Hammond came to show his Government’s support and was seen chatting with drivers and officials. Escorted by the AMTA president Willie Hamel, he entered the GIBSON Truck Simulator and took the wheel of a semi. Surrounded by three large screens depicting Alberta highways and various road conditions, with his hands firmly gripping the large steering wheel and skillfully looking at his sideview mirrors, Mr. Hammond was cheerfully focused on the task at hand, thankful that Gibson Simulator operator and driver trainer Mark Conley resisted the temptation of inflicting (computerized) nasty weather on this rookie driver. The day was long for the drivers, the volunteers and the officials: from the official start at 7am until the last driver completed the track at 5, the action was non-stop, and everyone seemed happy with the day’s accomplishments. They could now relax and attend the banquet at the Ramada Inn. A rich buffet was served, announced by a dynamic MC. At the Banquet attended by more than 200 competitors, volunteers and officials, Alberta’s Deputy Premier and Minister of Employment and Advanced Education Thomas Lukaszuk was a congenial guest, chatting with various individuals and sharing that “Trucking is an essential industry, the backbone of our industrial development. Our government supports the efforts of these organisations towards creating an ample supply of well-trained, safety-oriented truck drivers. We are paying a lot of attention to this industry, attracting young professionals and women as well. Women are very sought-after truck drivers, equipment and crane operators. Employers rave about their female team members. This is a very noble profession, and very well rewarded.” The Grand Champion was Rod Harrison (Canadian Freightways – Edm.) and the Rookie of the Year was George Catlin (Canadian Freightways – Edm.). The winners of the five classes are: in Straight Truck, Keith Franklin (Canadian Freightways – Edm. ), Single Single, Darren Tychkowsky (FedEx), Single Tandem, Keith Day (Bison Transport – Rocky View), Tandem Tandem, Rod Harrison (Canadian Freightways Edm. ); B-Train, Steve Calhoun (Canadian Freightways – Calg.) The Team Event winner was the Canadian Freightways Calgary Team, represented by Jorge Medina, Pat Thorne, Rick Ross, Lonnie Wilton. The 2nd and 3rd place winners are recognized on the amta.ca website. This event was to recognize the professionalism, driving and safety skills and knowledge of Alberta Truck Drivers. It accomplished this very well, despite minimal media exposure. Several Alberta Transport companies can now boast that one of their team is one of the very best professional drivers in Alberta! Feel free to view a new YouTube video created by Doug McFayden, recent team addition at the AMTA office in Edmonton: the link is http://www.youtube.com/watch?v=BpmS-nwWty0. Other dynamic AMTA ambassadors Bud (& Betty-Anne) Rice, Christine Tessier, Kim of PIC (Partners In Compliance), Lindsay and Nancy of the AMTA Edmonton Office, John Martin of BFL Insurance and Mr Nevin, the AMTA Calgary Gang and many others contributed to the success of the 2013 Alberta Professional Truck Drivers Championship. Good luck to Rod Harrison of Canadian Freightways, competing in the Nationals this summer!